Keeping pets’ ears clean contribute to their health and wellness by preventing irritation and infection that can be painful and potentially lead to hearing loss. Ear disease is one of the most common conditions in pets. The medical name for inflammation or infection of the outer ear canal is otitis externa. Otitis externa is estimated to affect 20% of dogs and 7% of cats in the United States. 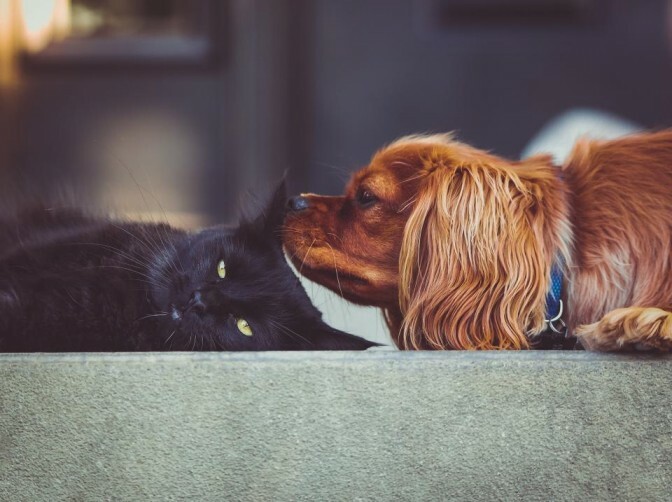 In 2007, Veterinary Pet Insurance reported that treatment for ear infections ranked as the number one medical claim made for dogs and number eight for cats. Why do pets get so many ear infections? Pets are prone to otitis externa due to the long length and L-shape of their ear canals. Debris and bacteria love to collect at the corner of the L and with the naturally warm and sometimes moist environment of the ears, it becomes the perfect environment for infection. Dogs that are most prone to ear infection include floppy or long-eared breeds (Cocker Spaniels, retrievers, basset hounds, etc) because the long ears hang over the ear canal entrance and prevent the canals from drying out. Dogs that swim and get water into their ears and pets with over-production of wax or hair growth deep in their ear canals are also at increased risk. Ear infection can also result from underlying conditions such as skin allergies and hormonal disorders such as hypothyroidism. Other conditions that can affect pets’ ears and mimic infection include ear mites, foreign bodies (especially plant material) and ear tumors. 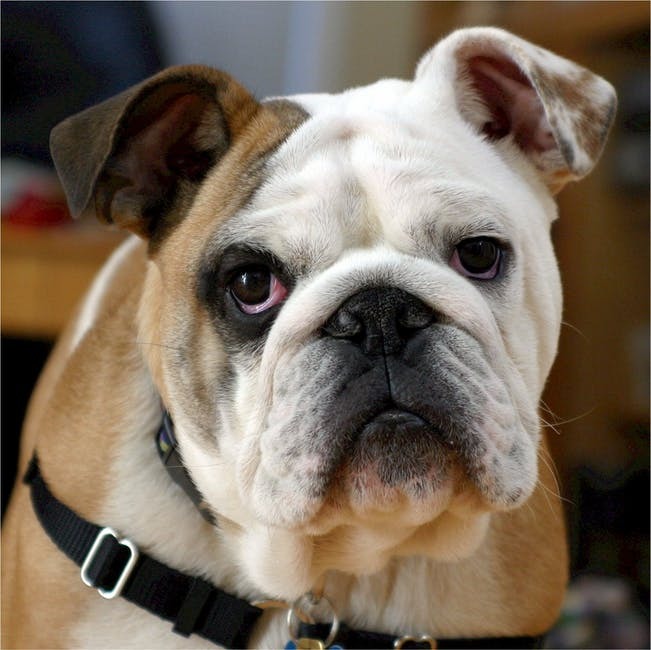 What are signs that your pet may have an ear infection? If you witness any of these signs in your pet, see your veterinarian for a thorough ear examination to determine the cause of the problem. If infections are left untreated, they can lead to hearing loss or extend into the inner ear and become life threatening. Due to the ear canal shape and the lack of an agile thumb and forefinger to use a Q-Tip, the ears are very difficult for pets to clean themselves! They rely on us to examine and clean their ears to help prevent painful ear disease. Natural pet products, such as Herbal Ear Wash, are best to help naturally and gently dissolve wax and debris. Herbal Ear Wash is gentle enough to use weekly and does not sting. 1. Place a good amount of ear wash into the ear canal. 2. Massage the base of the ear for 30 seconds to soften and release any wax or debris. 3. Allow your pet to shake his or her head to further loosen the debris. 4. Wipe out the loose debris and excess fluid with a cotton ball. 5. Repeat steps 1-4 as needed until all debris is removed. 6. Praise your pet and offer a healthy natural treat when you are finished! If cotton-tipped applicator swabs are used, they should NEVER be put into the ear canal. Misplaced swabs can rupture the ear drum as well as pack debris farther down into the ear canal, rather than removing it. For a video demonstration of ear cleaning, please visit PetEducation.com. Remember, prevention of ear infections is the best “medicine!” It is recommended that pet owners examine and clean their pets’ ears once weekly with a natural pet product as described above. If you have a long-eared pet, use a hair band or soft cloth to tie the ears above the head to allow complete drying of the ear canals after ear cleaning, bathing or swimming. Excess hair around and inside the ear should be removed to allow for better air flow and prevention of infection. It is also recommended to treat any underlying condition (such as allergies or hypothyroidism) that predisposes your pet to ear problems. A small amount of ear wax buildup is normal for your pet. If there is a bad odor from the ears, the ear canals look abnormal, or your pet shows discomfort during routine weekly ear cleaning, see your veterinarian promptly to avoid long term painful ear problems. These dog-friendly hotels not only cater to your pup, they roll out the red carpet! Struggling to find vacation spots that are truly dog-friendly? Melissa Halliburton, the editor of “Ruff Guide to the United States” and the owner of the dog travel directory BringFido, struggled to find dog-friendly hotels when traveling cross-country, as many hotels lacked pet policy information. When choosing a vacation destination now, Halliburton looks for what she calls the “trifecta of pet friendliness … great place to stay, play and eat,” with plenty of options for her dogs. “I always look for destinations that offer a variety of attractions and outdoor dining establishments,” says Halliburton. Brad Waggoner, a dog trainer and the owner of Cold Nose College, looks for hotels with grass commons, complimentary waste bags and receptacles and lower pet fees. Waggoner prefers to stay in dog-friendly hotels even when not traveling with his pups. “I want to reward those facilities who are open to having pets,” he says. Your dog will be greeted with a healthy treat, prepared by an executive pastry chef, as well as bottled water and a place mat. If you opt for the”It’s a Dog’s World Package,” five percent of your room rate will be donated to the Washington Animal Rescue League. Pets stay at no additional charge. You can get a special sign for your door — the green paw means, “Please service room, animal companion exploring city.” If you flip it to the side with the red paw, it means, “Do not disturb, animal companion napping,” and Spot can slumber on. On first sight, Hotel Burnham seems too good to be true, boasting a pet-friendly policy with no size or weight restrictions and no additional charge. When you look at the details, Hotel Burnham just gets better! Your dog will be given a treat at check-in, and your room will be outfitted with a dog bed, food and water bowls with a dining mat. Yes, turndown service is available for your pooch, and if you’ve forgotten any pet care products, Hotel Burnham offers a range of pet travel essentials. Dog walking and sitting services can be arranged through the concierge. Hotel Monaco boasts a resident director of pet relations, a Yorkie/silky terrier mix named Mr. Hershey Diego, who greets guests at check-in and tests all pet amenities to make sure your dog has the best stay. Your dog receives his own bed, food and water bowls, plus a leash and waste bags for walks downtown. A concierge is on staff to assist with booking pet sitting, walking and grooming services. One of Halliburton’s top four hotel stays, Loews Coronado Bay hosts a surf dog competition with Unleashed by Petco. Fun activities are just one of the many amenities Loews Coronado Bay offers dogs, part of their Loews Loves Pets program. Your dog receives a welcome package, including treats, a name tag and bowls. Your dog will settle in nicely, with his own bed and a room service pet menu (yes, pet room service!). Loews Coronado Bay will also assist you in locating dog walking routes, pet sitting or walking services and area pet-friendly restaurants. Texas hospitality extends to your dog at The Driskill in Austin, Texas! The Driskill offers a Pampered Pet Program, where your dog will be treated to his own bed, bowls, place mat, bottled water and gourmet treats. Guests venturing out with dogs are provided recycled waste bags and a pet map of Austin, featuring dog-friendly spots. Two additional tips Waggoner offers is that pet owners should travel with their pet’s vaccination records and should have their cell phone number printed on the dog’s tag. “A home phone is no help if you and your pet are separated and you’re traveling!” he points out. Waggoner suggests you ask yourself if your dog is ready to travel and is comfortable meeting new people and exploring new places. If not, Waggoner says that it may be better — for both you and your dog — to leave him at home. But if everyone’s ready, by the end of your trip, you’ll be jealous of your pooch’s special treatment! An important part of keeping your cat healthly and happy is checking and cleaning their ears. Because the ears are one of the few parts that cats can not reach themselves they need a little help from a loving owner. Keeping your cats ears clean is extremely important because any unremoved dirt, debris, or wax can clog the ears and cause infections. Regular ear cleaning at home augment’s your cats own natural grooming habits. • You typically only need a few drops of the ear solution. Squeeze the bottle and let a few drops fall on into your cat’s ear canal. • Start massaging the base of your cats ear gently. You should hear a ‘squelch’ while you do this. Repeat the same procedure with the other ear. After both ears have been cleaned, let your cat shake its head, this loosens the waxes. • Wipe the solution by wrapping your forefinger with cotton wool, this should clean off wax and debris. Do this gently though and do not poke in too deep, or you might hurt your cats eardrum. This is the season to be miserable for certain anxious dogs who are terrified by the unwelcome arrival of summer thunderstorms, complete with lightning, the rumbling or sharp cracking sound of thunder itself, heralded and accompanied by darkening skies, gusting winds and heavy rain. Before and during the storm there may be other cues that dogs can detect and associate with the storm, such as changes in barometric pressure, static electric field and, possibly, even ionized particles in the air. Either way, this whole gestalt of the thunderstorm experience strikes pure terror into the hearts of certain dogs. Certain types and breeds of dogs seem more prone to thunderstorm phobia. The typical storm phobic dog is largish in size, weighs more than fifty pounds, and has a dense coat. Herding breeds and their crosses are overrepresented in this troubling condition. Clinical signs range from clinginess, hiding, panting, pacing, whining, and shaking in sheer terror. In extreme cases, dogs exposed to a raging thunderstorm in their owner’s absence will destroy things in frantic attempts to escape from the home. Some dogs succeed in breaking through fly screens, may leap to “safety” from a second or third story window and, if unhurt by the fall, will run for miles, often into the next town to be rounded up by animal control. 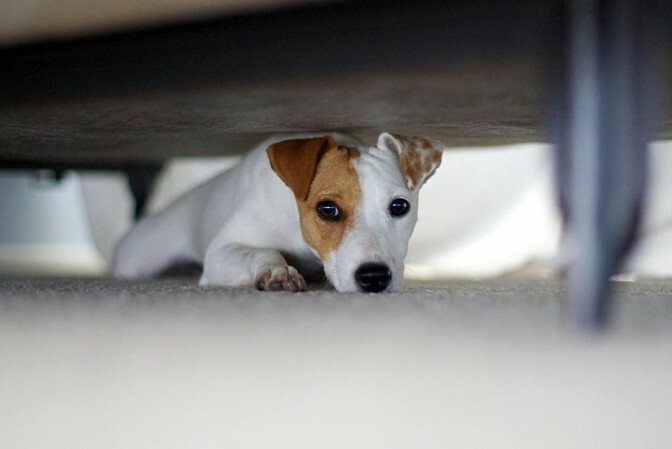 When owners are asked when their dog first developed fear of thunderstorms they report seeing signs before their dog is a year old but the condition often acutely worsens dramatically between five and nine years of age. It is at this stage that owners seek help from a veterinarian or a behaviorist. The sudden exacerbation of storm phobia mid-like often occurs during a particularly violent storm. Years ago, I saw three German shepherds one after the other with severe thunderstorm phobia all of whom sought sanctuary by jumping into a sink or hand washing basin. Soon after, I encountered other dogs who took refuge in the bath, shower pedestal, Jacuzzi, behind the toilet tank – and one dog sought out a kiddy play pool where it would stand up to its ankles in water during storms. It occurred to me that all these places are electrical “grounds” and would prevent the buildup of static electricity in the dog’s coat. My “static electrical theory” of thunderstorm phobia was born. As some confirmation of this theory, I had several owners report that they got static shocks from their dog when they touched it during a storm. It wasn’t so much that being charged with static electricity during storms that was aversive – I conjectured – but that if the statically charged dogs touched some metal object (with their nose perhaps), they would receive a painful electrical jolt to confirm that storms were not only scary but also that they bite! This would account for the sudden exacerbation of storm phobia mid-life as well as dog’s ability to detect storms well before they arrive (static fields change before and during a storm). The static theory may not apply to all dogs with thunderstorm phobia, however, as only fifty percent of the dogs in our study manifested what I came to refer to as bathroom seeking behavior. The remaining dogs may have had just plain noise phobia. Thunderstorm phobia is not easy to treat behaviorally as the standard method of dealing with fears, that is, systematic desensitization along with counterconditioning, does not seem to work for thunderstorm phobia. While there are numerous CD’s available on the market for such desensitization, it is something of a fool’s errand to even try this approach as it is so unsuccessful. The reason for this lack of success is probably the multi-faced nature of storms — thunderstorms do not simply deliver a scary loud noise but have all the other features of thunderstorms referred to above. Here is what you can do to help a dog who is terrified of storms. Prevent or attenuate exposure to the full brunt of the storm. This may be difficult in some living situations but others are set up for it. The ideal situation would be to convert a semi-subterranean finished basement into a thunderstorm bunker in which the dog’s exposure to all the elements of the storm is minimized. This idea is similar in concept to that of a tornado bunker in the tornado belt of the Midwest. The safe place is prepared by blocking off all windows so that there is nothing to see outside that can terrify the dog. The safe place should be lit with bright lights to minimize the sight of any stray lightning flashes around the edge of curtains or cardboard insets in the windows. Also, the safe place should be bathed in soothing music to cause relaxation and to act as white noise to drown out faint sounds of thunder. The area should be equipped with food, water, toys, a dog bed, and initially the owner should take the dog to the safe place at the onset of a storm and engage in some fun activities – like clicker training – with their dog. Yes, initially the dog must be trained to go to the safe place but in time will learn that this – and not the sink or bath – provide the best protection. Anti-static storm wear – There are several proprietary jackets that dogs can be fitted with during storms to help reduce the aversive nature of the experience. Two of them work through pressure, specifically the Anxiety Wrap® and Thunder Shirt®. They may provide some comfort but, in my view, the Storm Defender®, works best and we have some evidence to support this view. Storm Defender® is a little different from the other jackets in that, as well as providing controlled pressure, it has an anti-static lining and prevents the buildup of static electricity in the dog’s coat. In one study we conducted, Storm Defender® reduced signs of thunderstorm phobia by seventy percent. Medication – Although we don’t take medicating dogs lightly, this is often the only thing that can be done to assuage the extreme anxiety of seriously affected dogs. Typically Prozac®, or a related drug, is used as background therapy on a daily basis to stabilize the dog’s mood and build confidence. Secondly, an “as needed” medication in the form of a Valium-like drug, such as Xanax® (anti-anxiety medication) or clonidine (which attenuates the fear response) are the ones we recommend. Both these medications must be given an hour or two before a storm arrives, which means that owners must pay attention to the weather forecast or sign up for storm warnings on their cell phone so that they know when to give these medications. Using a combination approach like this — in one largish study — thirty-two out of thirty-two dogs showed improvement in all manifestations of thunderstorm phobia and two were considered cured. By the way, don’t try this at home … always seek you veterinarians advice before giving your dog any prescription medication. A very difficult situation occurs when thunderstorm phobia and separation anxiety co-exist. Unfortunately, this situation prevails in about forty percent of dogs with thunderstorm phobia. In such dogs, they may just about be able to hold things together during a storm when their owner is present but things are much worse when a storm occurs in the owner’s absence. These are the dogs who destroy property; the ones who jump out of windows and run for miles. In such dogs it is important to address separation anxiety and thunderstorm phobia simultaneously for improvement to be made. It probably preferable not to leave such dogs home alone during storms unless absolutely unavoidable. When storms are forecast, such dogs should preferably be boarded with a friend or relative, perhaps one with a dog because this is one condition in which the presence of another dog has a beneficial effect. Owners can also make use of boarding kennels, the vet’s office, or even bring their dog to work, anything rather than leave it alone during a storm. A combination of treatment of thunderstorm phobia and avoidance can together can work to produce a livable situation and make these phobia dogs’ lives easier. “Where there’s a light, there’s a way,” it is said, but where there’s lightning (and thunder) there are dogs who desperately need our help and support. Severe cases may be turned into shelters by unwitting owners who don’t realize that something can be done to help their terrified pet and prevent occasional serious damage to their home. Rest assured that it is now possible to successfully manage thunderstorm phobia in the vast majority of cases. Just come and see us if anyone tells you otherwise! Obesity is not just a growing problem for Americans—it’s a problem for our pets. As our lifestyles become more sedentary, is it any surprise that veterinarians report that nearly half of their canine patients are overweight? What can we do to help our pets? The first step is admitting that there’s a problem. Of course, our fat cats and dogs are cute, cuddly and adorable. But is the extra weight worth the risk? Obesity is associated with canine and feline diabetes, arthritis, heart and lung disease, and other disorders. 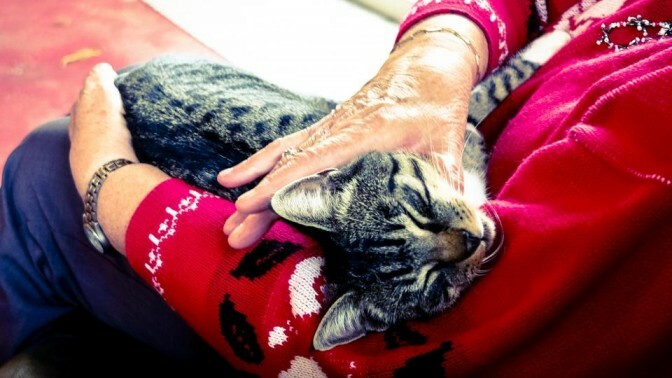 So what can we do to take our pet’s health more seriously? Feed your pet differently. What type of diet is best for your pet? Commercial cat food is often high in carbohydrates, wreaking havoc on our kitties’ blood sugar levels and digestive systems. Halo® holistic cat food is meat based and specifically designed for optimal feline health. Healthy dog food from Halo can help to keep your pooch strong and lean. And watch the portions when you feed your pet: Two to four small portions a day is ideal. Exercise your pet! Walk the dog. The workout is as good for him or her as it is for you. It’s a bit harder to nudge your cat into activities, but an interactive cat toy or a laser-pointer session could do the trick!